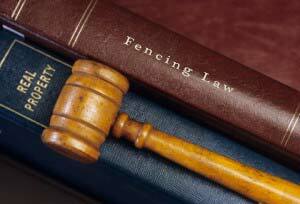 All too frequently people never considered fencing laws before putting up a fence. In fact most laws about putting up a fence seem rather absurd. However there are quite a number of laws that a wise person would give thought to. The most common mistake is the believed idea about the height of the fence. People searching through the internet would find the maximum height to be two meters, however, what they fail to realise is that the most important details have been missed out. The maximum height of garden fencing is ‘two meters without planning permission’. So technically, a person can put up a fence as high as they want with proper planning permission. This can get somewhat tricky. For instance, fences that are lower in height than two meters do not need planning permission, but if a fence is two meters high, permission would be needed to put up a trellis on top of it, as a trellis further heightens your fence. In fact anything higher than two meters other than plants or shrubs could be problematic. Anything additional above two meters of fencing would require proper permission. For Homeowners who have garden fencing on both sides, things can get even trickier. Frequently, neighbours share fences with other neighbours. Common concerns are who owns the fence? Who’s responsibility is it to repair the fence? Which neighbour owns which fence? And here is where you would find a load of misleading information. Apparently, according to the knowledge of some on the internet, if a person stands with his back to the house, he owns the fence on the right hand side. hence are your responsibility for repair. The exact same principle of owning fencing is applied to farm lands where a ditch or a hedge divides the land. You can’t go digging ditches on your neighbour’s property. Similarly you cannot dig a ditch and throw up a mound of soil on your neighbour’s land. So the ditch must be on your land and so must the mound of soil that you throw up. To sum it up both the ditch, the mount of soil and also the hedge that grows on it must be on your own property and not your neighbours. So this is where seemly complex laws start making sense if one is to look at them and use common sense. One the most common consideration is safety. If your Sheffield fencing is on the edge of public property, then the rule is that anything unsafe about the property is illegal. A possible injury to a passerby, barbed wires on top of fences and protruding nails are some examples of concerns of public safety and logically that makes sense. You would not want to face any liability for a careless passerby bumping into to the barbed wire on your fence. Another apparently mainstream yet stupendous idea among people is putting up shards of glass on top of the fences to deter buglers. This is now illegal, since someone trying to break in to your property might injure themselves while doing so and according to the law that injury is now the liability of the property owner. The simple laws are often mistakenly changed by people. There are people who would figure out their own reasons into making sense out of these laws but the fact is they are reasonable.